In the October 3rd issue of 'Weekly Shonen Jump', producers revealed that author Nishio Ishin and illustrator Akatsuki Akira�s manga 'Medaka Box' would be adapted into an anime series. The broadcast date and the voice cast will be announced at a later time. 'Medaka Box' begun its serialization back in May of 2009. �The total sales for the series' 12 volumes is currently 3 million copies. 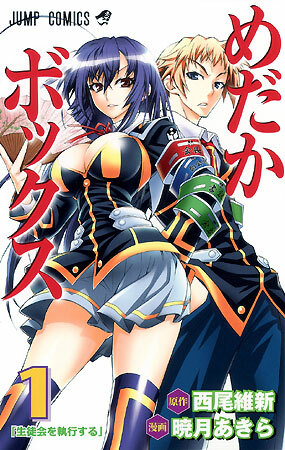 This popular series follows the story of a beautiful, talented, and rich 'Perfect Student Council President'�Kurokami Medaka. �One day she�establishes a suggestion box (medaka box) with her childhood friend Hitoyoshi Zenkichi, together they solve problems for their fellow students. The author of this comic series, Nishio Ishin, is a well-known novelist who has written other popular manga including 'Bakemonogatari'. �This will be his fourth work to be adapted to an anime.